Among the deluge of Calviniana that appeared in his 500th anniversary year there are a number of biographical studies, of which this by Bruce Gordon (late of St. Andrews and now of Yale) is the most thorough and scholarly. It bears comparison with the work of the Reformation scholar Herman Selderhuis, John Calvin, a Pilgrim’s Life, (Leicester, IVP, 2009), if only because the two books have a similar structure. Each author has chosen to write in shortish sections within each chapter, though Gordon’s sections are longer. But both books give the impression of Calvin through his portrayal in short scenes, rather like videoclips. This style makes the books easy to pick up and put down, and gives their authors freedom to roam from topic to topic as he unfolds the life. Of the two, Selderhuis’s is lighter in tone, and may even make you laugh. Gordon sets out to be more serious, and he is certainly successful in that. The present-day biographer of Calvin who aims to write for a general educated readership is faced with a dilemma. There is a good deal of drama to Calvin’s life. His career was adventurous, and so an account of it ought to make for a good read. His life even as a theologian, controversialist and bible commentator was lived at such a breakneck speed that by his early fifties he was worn out. (When he wrote about divine providence he advised the Christian to live prudently, to take note of the divinely-appointed connectedness of means and ends. But he resolutely failed to heed that advice himself, at least as regards his own health). But what explains the drama – his flight from France, and then from Geneva, the frequent political turmoil in that city, the quarrels, the swings of temper, his deliberate offensiveness to his opponents? Is there a connecting thread? Yes there is, but now the biographers’ dilemma surfaces. For what made Calvin tick were ideas that now seem remote and unappealing to the modern sensibility, about divine grace and sin, about who has the right to excommunicate a person from church, or about what exactly goes on in the Lord’s Supper. How could these ideas motivate a life, and lead a sensitive soul, with ambitions to be a reclusive scholar and nothing more, to take centre stage and to run himself into the ground for their sake? For Calvin, certain ideas had consequences, deeply personal consequences. Here at least there is consistency in the man. If the idea of your God is not one that can flit in the brain, then discipleship of such a God cannot be a fitful thing. Knowing this God is full-time work. 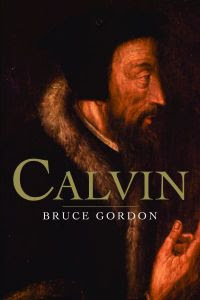 Bruce Gordon does a pretty good job, it seems to me, in producing a narrative of Calvin’s life that is intelligible in terms of the impact of his ideas upon his own unique personality. That is, he nearly always provides the reader with sufficient theological and religious background to make what Calvin did and suffered intelligible, and sets his activities in the context of his own conversion, even though the circumstances of that momentous change still remain shadowy, and this fact certainly does not help any biographer. To present such a man in such a way is a considerable and praiseworthy achievement. This is not a theological biography, but it is pretty clearly the biography of a theologian, one of the great doctors of the Church. So Professor Gordon does not simple chronicle events; he tells us, for example, the significance of Calvin’s commentary on Romans, and goes into Calvin’s relations with the various Swiss city churches with great thoroughness. He analyses the reasons for the unevenness of Calvin’s international impact, and goes into the printing and publishing of those works of Calvin’s which were rapidly translated and exported, and on which his reputation came to rest. A couple of things puzzled me a bit. One is Professor Gordon’s claim, which he makes twice, that Calvin’s early book, Psychopannychia, written in 1534 but finally published (after going the rounds in manuscript to various of his friends) in an altered form in 1542, a work against the Anabaptist doctrines of soul sleep and ‘mortalism’ was in fact aimed at Michael Servetus. (43, 216) The reason for Calvin giving these doctrines priority remains something of a puzzle, but it is hard to believe that he already had Servetus in his sights. Servetus did agree to meet up with Calvin in Paris in 1534, an appointment which Calvin kept but he did not, to Calvin’s annoyance. The author provides no evidence for his claim that Psychopannychia, was ‘partly directed to Servetus and his circle in Paris’, or even for the view that Servetus had such a circle. Bernard Cottret, whose biography of Calvin is a good resource for this kind of thing, does not offer a hint of such a connection. One place where (understandably perhaps) the author’s concern to provide his reader with theological content, or a theological context, seems to fail him is over Calvin’s controversies with the Lutheran theologian Westphal over the Supper. The author recounts in considerable detail each blow and counter-blow and counter-counter blow of this seemingly interminable debate. But he never tells us what the theological issues were between Calvin and Westphal, or how it came about that Calvin had such an ecstatic view of the significance of the Supper, ecstasy caught by his words from the Institutes quoted at length on page 303. The debates about the Supper were tragic enough, but there were real issues at stake, substantive differences . The author’s reluctance to tell his readers what these are makes it hard for them to judge his opinion that Calvin’s debate with Westphal was a personal defeat for him (249), or even what this means and how it could be identified as such. Nevertheless, this is an excellent general biography of the Reformer, sympathetic, engaging and informative.